As a trainer I’m always looking for ways to improve the quality of the exercise routines for both my clients and myself. I’m also a strong believer in using highly productive, functional exercises, incorporating alot of compound movements and unique training accessories. In addition to "getting leaner" or "getting stronger", one of the common goals I hear from many clients is that they want to develop their "abs". They want a six pack; a toned midsection; a solid core. However, when it comes to developing a powerful core, most traditional "ab" exercises such as crunches and sit-ups are relatively ineffective. For a beginner, crunch variations are OK... but once you have been training for a short while you need to look for more productive options. So when I first heard about the Power Wheel I was interested. This product is awesome for core strength, stability and balance. There are so many exercises you can do with it, using both your hands or your feet. 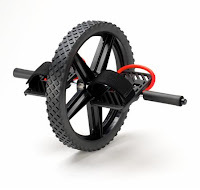 I had used the basic ab wheel before (you've all seen it... sold in every Walmart and Canadian Tire), but the Power Wheel takes it to the next level by adding foot pedals which allows for several more training options. After using it myself I introduced it to several of my clients… it was a hit! But because there aren't many Canadian distributors, and it's pricey to get one from the US, I decided to stock it myself. Check it out at http://www.strongestcore.com/ ... there's a few pics of exercises you can do with it there as well. This is one training accessory I highly recommend. Let me know what you think of it. Been using GRIP4ORCE for a couple of weeks now , and my arms are jacked. These things are awesome. I do half the set and get triple the pump. Checked out Grip4orce... looks good, similar to FatGripz which I use. Great for grip strength and increasing arm / upper body training. Not much to do with core training which I was posting about, but thanks for the heads up on the nice training accessory!